After a hard winter in Vermont, you might notice a few dips and bumps in your patio or walkway from frost heaves. Or maybe the roots of that pretty flowering crabapple have crept under the pavers, causing them to rise or shift. Or maybe someone dropped something really heavy and cracked a paver. Whatever the problem, we have good news for you. Many patio and walkway repairs are easy for homeowners to accomplish on their own. First of all, determine the reason for the problem. It’s a good idea to get a grip on what caused the damage so it doesn’t happen again. You can probably point your finger at shifting ground, improper drainage, or root invasion. Backfill settling is a common cause of patio failure. Fortunately, most settling occurs during the first four years. To repair small areas, add more base gravel and pack it down. The leveling sand directly under the pavers may have shifted or washed away. In this case you can just re-level the sand, adding more as necessary. If you see roots, are they mature, and are they below the leveling sand? If so, just re-level the sand. Roots that are still growing or are too close to the surface will have to be removed. Trees and bushes normally can do without a few roots, so go grab the loppers and cut off the offending roots. If there is no obvious cause such as water, roots, etc., you can just add some base gravel and compact it. After having explored the cause of the problem, it’s time to put things back together. Re-level and compact the gravel base with a hand compactor. If it’s a small area, a brick will work for this. If it’s a large area, you might want to consider renting a vibrating plate compactor. If you aren’t aggressive with packing down the gravel base, the patio is likely to fail again. The test of a well-compacted base is to bounce a tennis ball on it. The ball should bounce like it’s on a court. Now it’s time to re-level the sand. 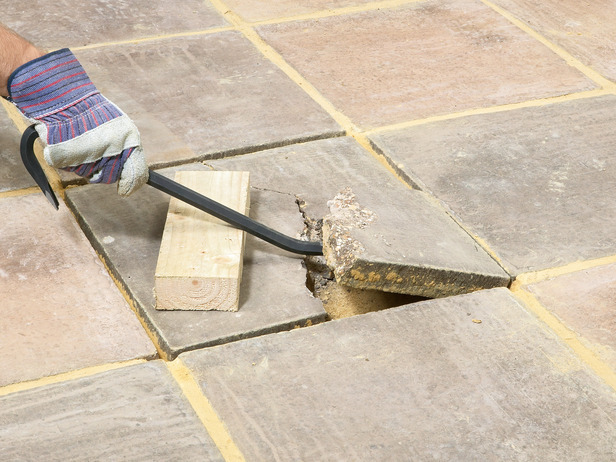 Small areas can be smoothed out with a trowel, adding or removing sand as necessary. For larger areas use a four- to six-foot-long 2 x 4. 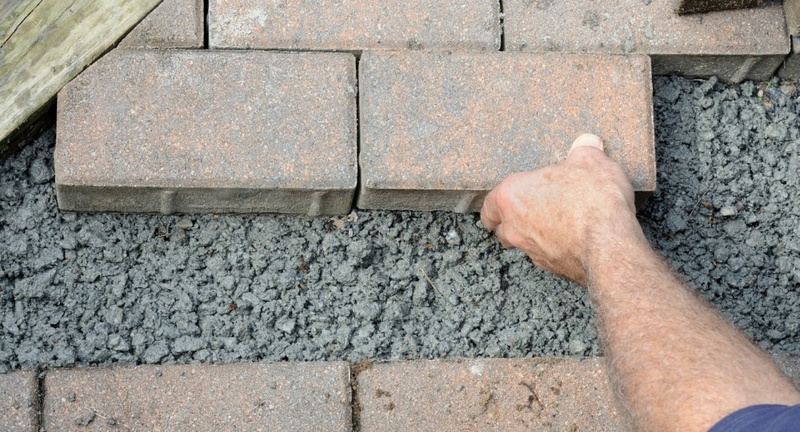 Make sure the sand is slightly higher than the bottom of the pavers you are trying to match, so that when you compact the pavers, the sand will compact as well, lowering the pavers to the proper level. And now… the moment you’ve been waiting for: re-setting the pavers. Once they are in place, spread joint sand with a stiff broom. We recommend the Gator Alliance polymeric sand. Now set the pavers with a dead blow sledge, hand compactor, or a vibrating plate compactor depending on the pavers’ size. 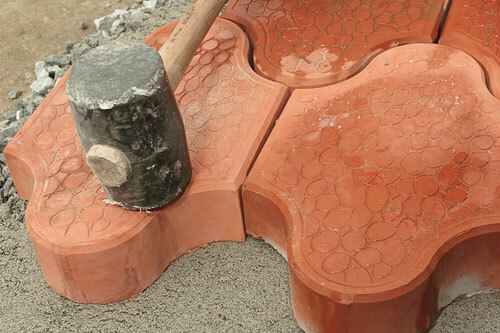 Repeat the addition of sand and compaction several times to ensure the joints have sufficient interlock between the pavers.